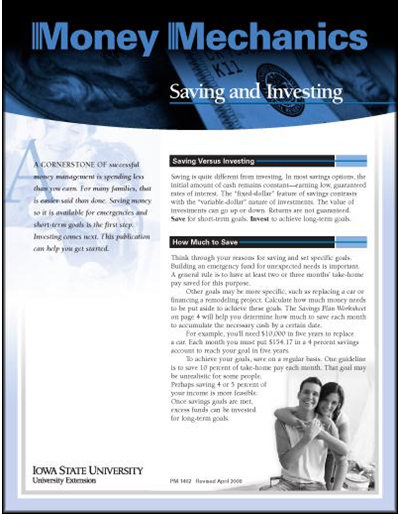 This workbook discusses financial basics, insurance, investing, retirement planning, and planning for life events. 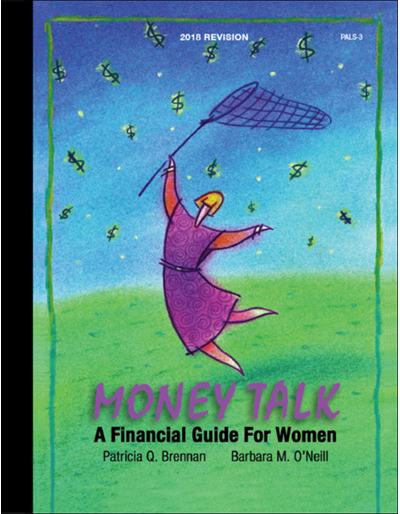 This practical, clearly written guidebook is the work of two certified financial planners and educators at Rutgers University. Justin Van Hof's route to become a farmer was nontraditional. He graduated from college, worked in his father's business and was employed in other professions, yet always returned to farming. It took 16 years, yet Justin has found his niche as a farmer working as a salaried manager for a large diversified farming operation. 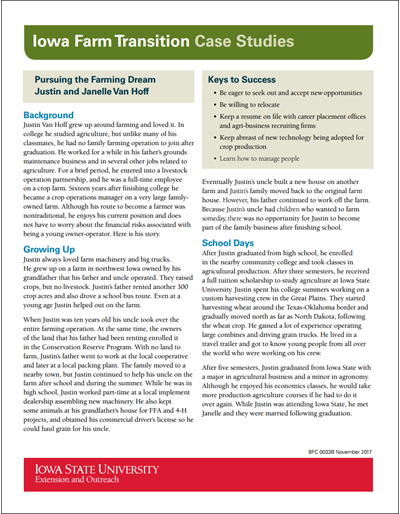 This case study highlights the transition planning process and timeline, tools used, lessons learned, and the Van Hof's advice for other individuals considering a career in farming. Questions about employee status and career opportunities are included for family or classroom discussions. The Loomis family from northern Iowa has recently completed a successful family farm business transition to the next generation. The transition of their row crop and swine farm spanned the first 22 years of the younger generation's farming career, was well planned and implemented gradually. 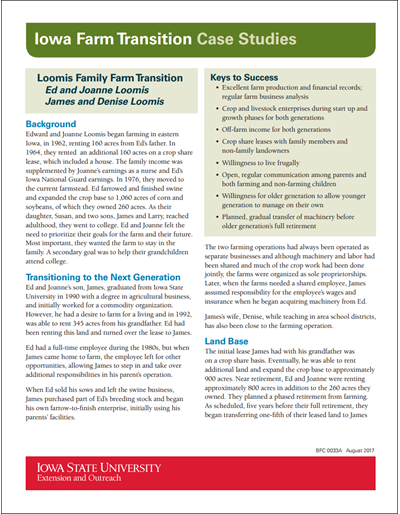 This case study highlights the transition planning process and timeline, tools used, the older generation's estate plan, lessons learned, and the Loomis's advice for other farm families considering a farm business transition. Questions about the family's current situation and possible future of the farm are included for family or classroom discussions. 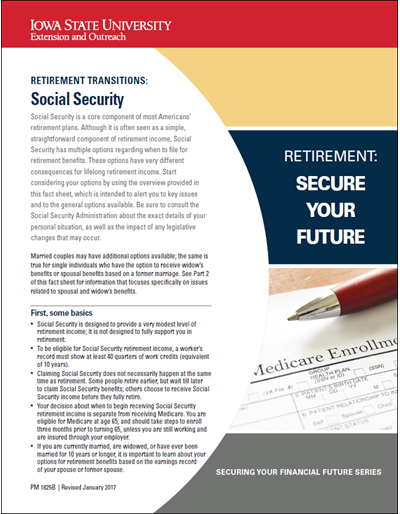 Social Security has numerous options regarding when to file for retirement benefits that have very different consequences for a lifelong retirement income. 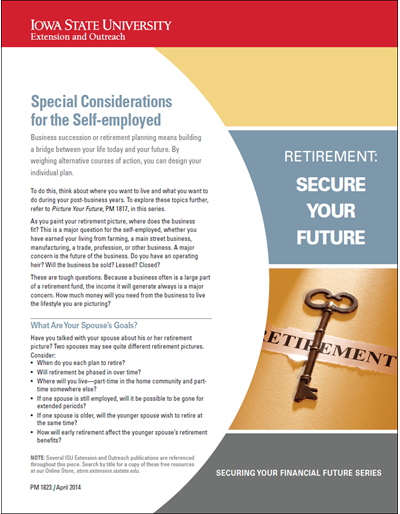 Use the information in this publication to start considering social security options during the transition to retirement. It is difficult to make decisions or even know where to start after the death of someone close to you. 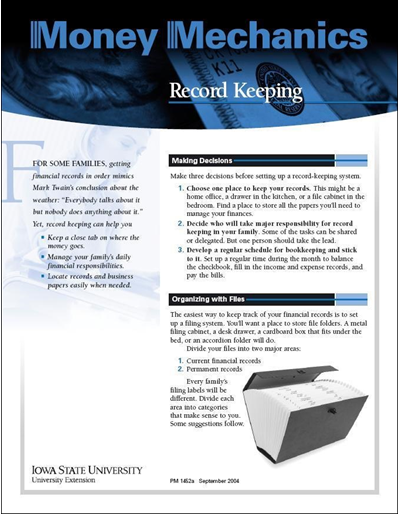 Here are practical suggestions regarding financial and legal matters. Creating a written spending plan and living below your means are discussed to help you consider the choices you have for retirement income. Learn about several tax-advantaged retirement plans -- their tax benefits and possible employer match. Many farm families find it difficult to know how much to spend each month for family living needs. Income may be both irregular and unpredictable and there are important differences in managing farm family finances versus nonfarm family finances. 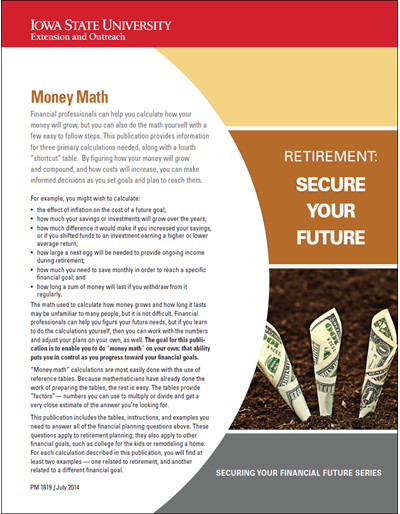 Figure out how your money will grow and compound, and how costs will increase to help you make informed decisions as you set retirement goals. 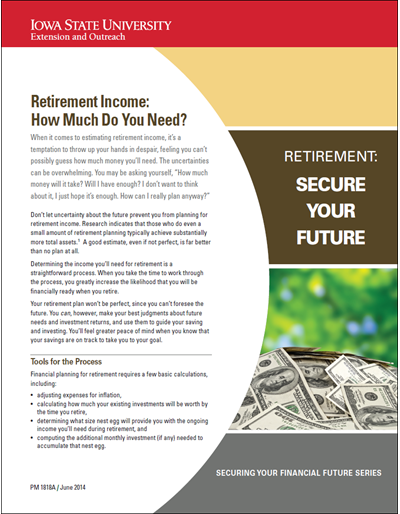 Use this five step retirement income planner worksheet to take the mystery out of what you'll need. Get detailed help from this expense worksheet that considers early, mid, and late retirement needs. You have the most control over your savings and investments -- understand the risks and returns. 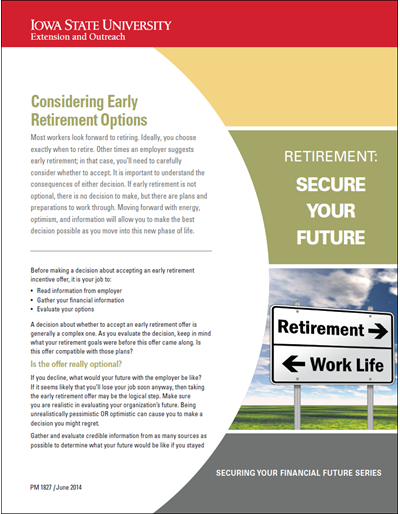 Several factors should be considered when making a decision about whether to accept an early retirement offer. Understanding those options will allow you to make the best decision possible. There is more than one approach to arranging your financial resources for retirement, each with advantages and disadvantages. 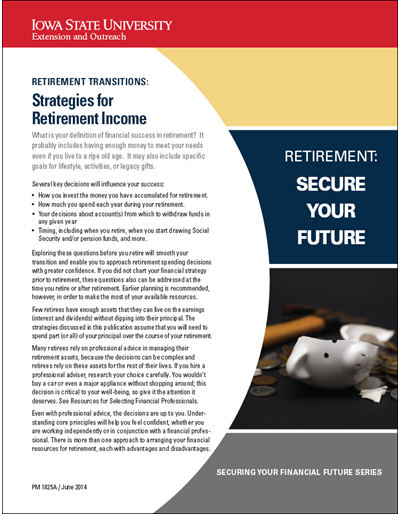 Learn more about income strategies to ensure a smooth financial transition into retirement. Tax-advantaged options for retirement saving and investing are designed to help people accumulate resources that will support them during retirement. 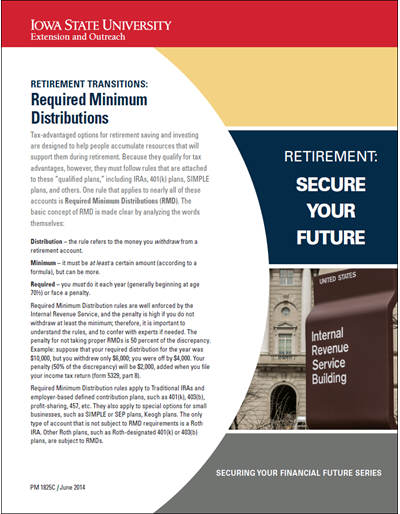 Learn more about Required Minimum Distributions (RMDs), how they affect retiree finances, and how to avoid penalty. Annuities can play a valuable role in structuring your retirement income, but they are fairly complex products and may come with high fees. 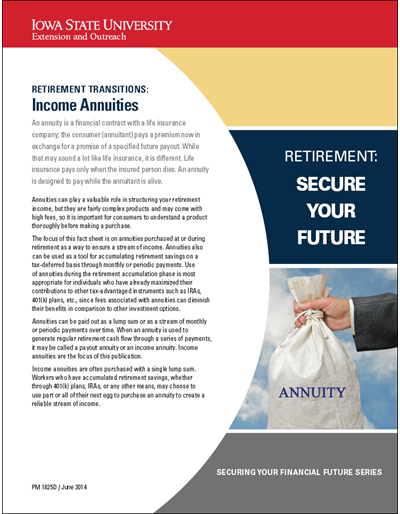 Learn more about the types of annuities and pros and cons of each. Use the consumer worksheet to evaluate your income annuity options before making a purchase decision. When you consider your ideal retirement, cost is a factor. 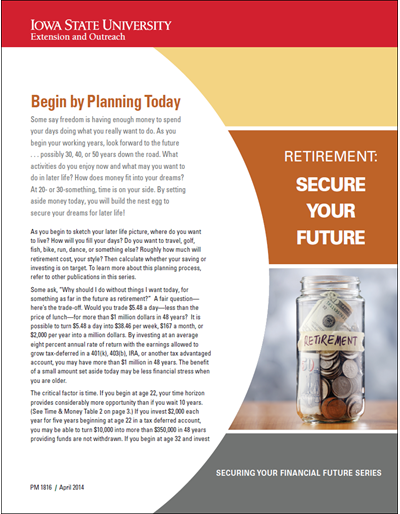 This publication covers the basics of financial planning, including the value of starting early, contributing often, and finding investments that are right for you. 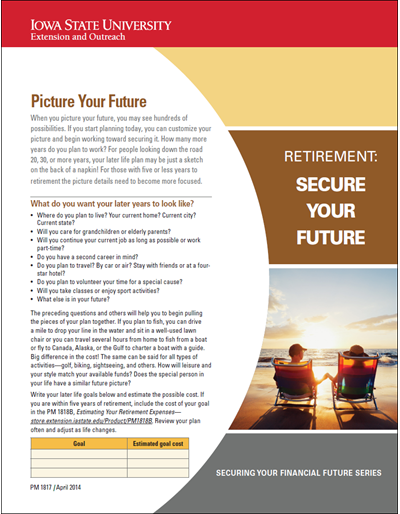 If you start planning now, you can customize your retirement picture. Ask yourself these important questions and begin working toward securing it today. 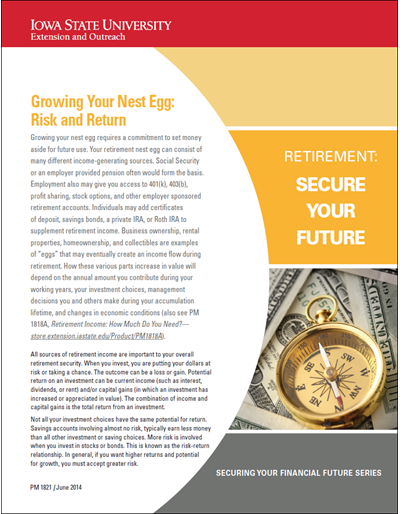 Find out how your retirement will be affected by your business, whether you transfer ownership, sell, or lease. Family-owned businesses have unique issues. Some decisions people make or do not make can impact their financial future or that of their loved ones. 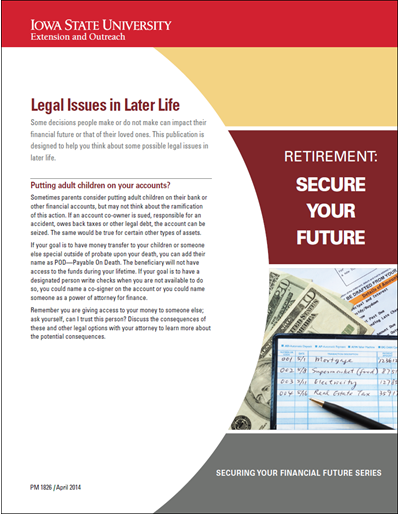 This publication is designed to help you think about some possible legal issues in later life. 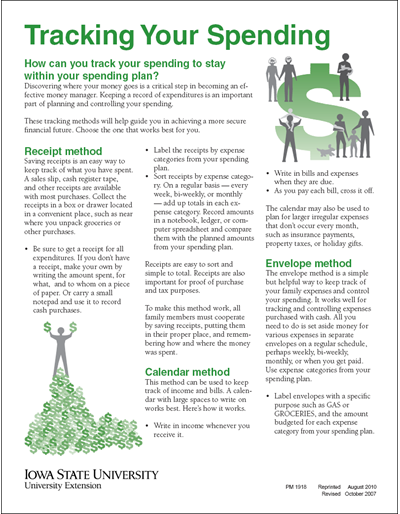 Manage your money with one of these six tracking methods: receipt, calendar, envelope, checkbook, account book, or computer software program. 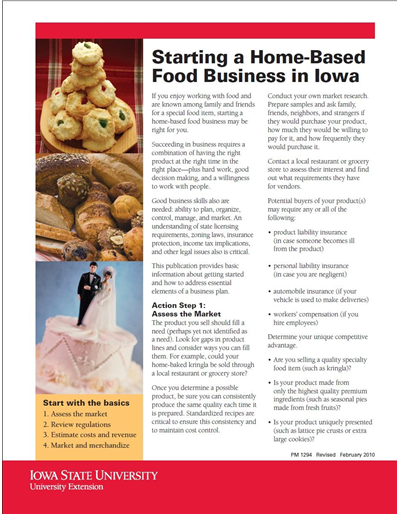 Find the information you need to sell food products from your home. Includes Iowa licensing and inspection requirements. 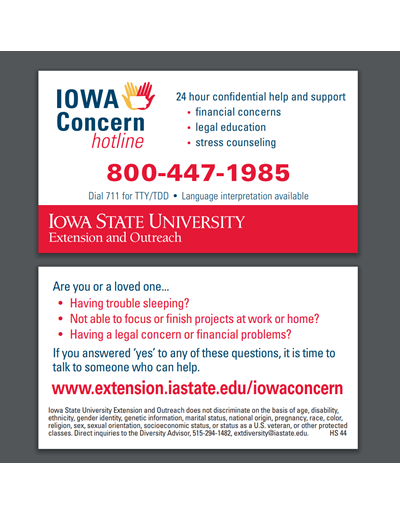 Also includes contact information for additional help. Full color, 4 page brochure. Managing money means making choices. This game will help you decide what is most important to you among categories like housing, food, and recreation. 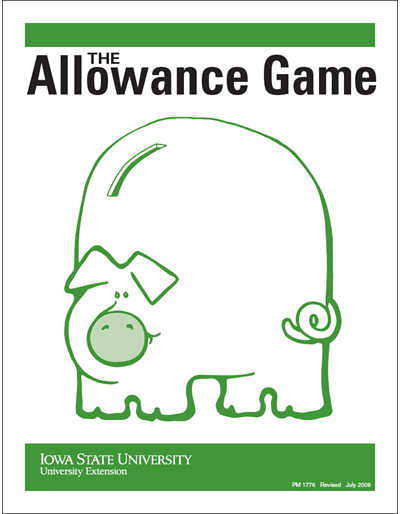 Help your child make decisions about spending allowance money wisely. Publication includes game instructions and questions to begin discussion. 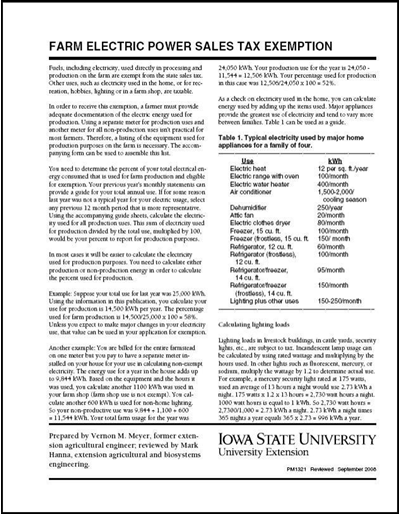 Fuels, including electricity, used directly in processing and production on the farm are exempt from Iowa state sales tax. To receive this exemption, a farmer must provide adequate documentation. 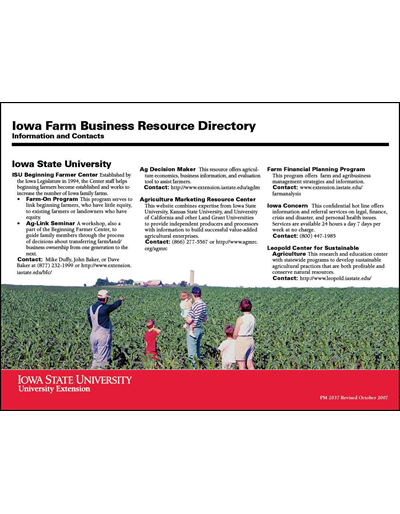 This publication provides information, worksheets, and a sales tax exemption certificate to aid farmers. 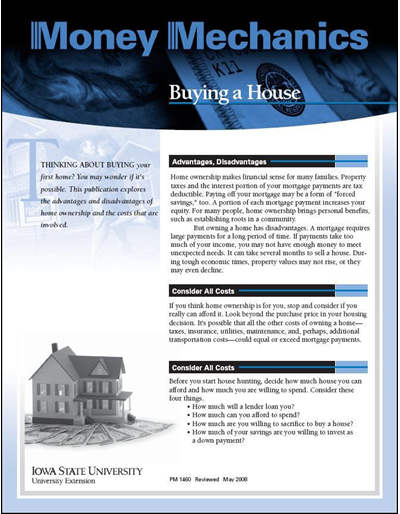 This publication and worksheet explore the advantages and disadvantages of home ownership and the costs that are involved. You can estimate the maximum loan and housing price you can afford. Saving money so it is available for emergencies and short-term goals is the first step of success money management. Investing comes next. 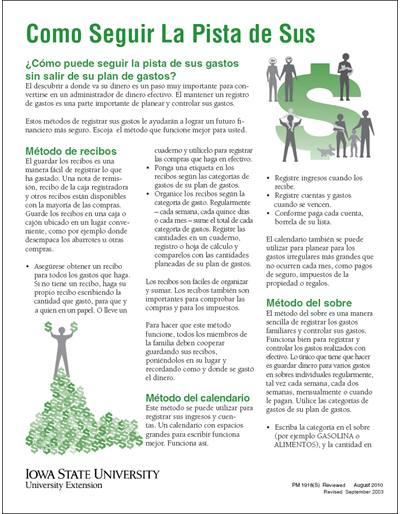 This publication can help you get started. 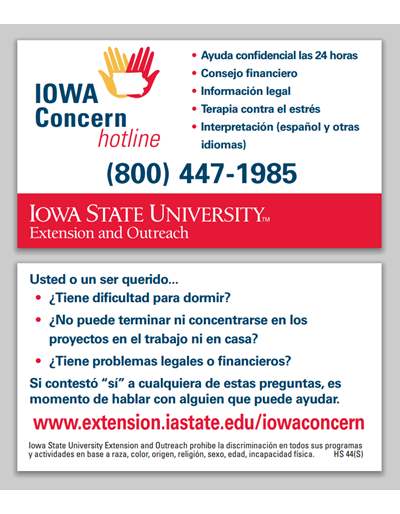 This publication offers contact information for programs that will help Iowa farmers improve their operations. 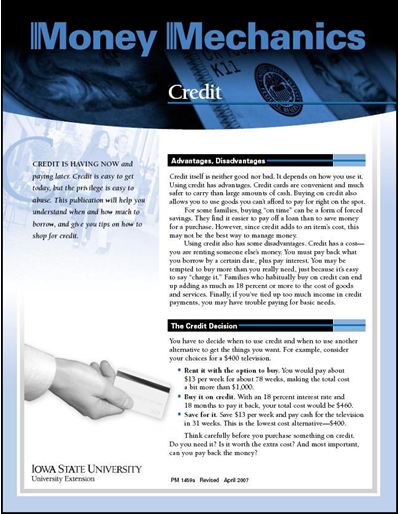 This publication will help you understand when and how much to borrow, give you tips on how to shop for credit, and includes information on credit reports and credit rights. 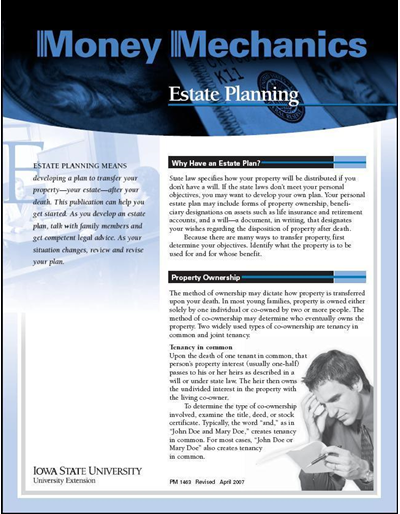 This publication can help you develop your estate plan by providing details on the process and explaining legal guidelines. 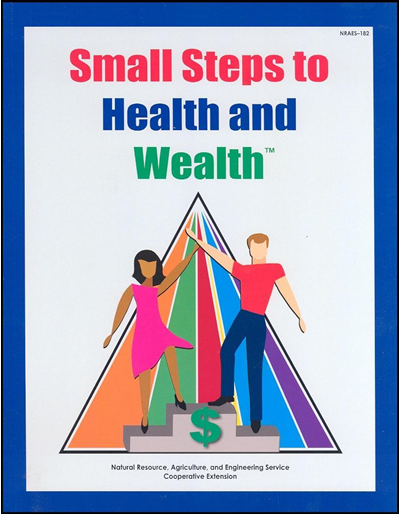 Twenty similarities between personal health and wealth issues are described and common obstacles to change are reviewed. Then twenty-five strategies to change behavior for improved health and increased wealth are described. Fourty-four worksheets and sixteen information-packed tables help the reader adapt these strategies to their situation. Health and wealth benchmarks are included to help define health and wealth goals. Includes extensive lists of reference and web-based resources. Most families spend more on transportation than on any other expense category. 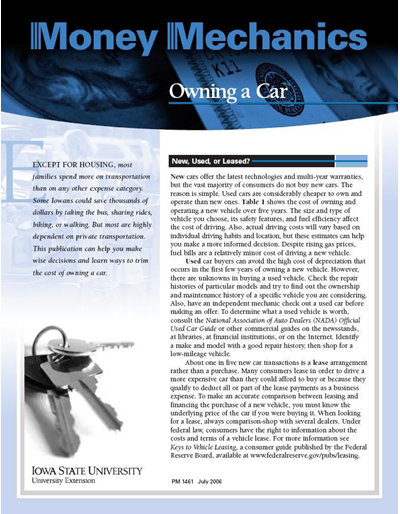 This publication can help you make wise decisions and learn ways to trim the cost of owning a car. 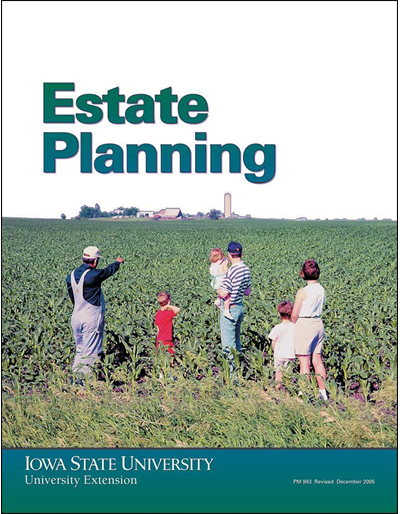 This publication is designed to acquaint you with the considerations, problems, and tools available in estate planning. It has been updated to include 2005 revisions to the tax law. Life insurance protects your family’s financial resources when you die. 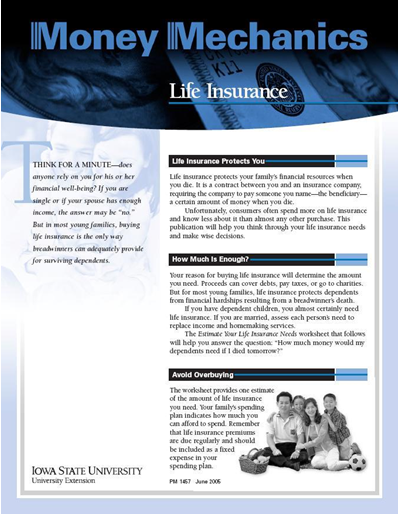 Learn tips on buying life insurance, how to estimate your insurance needs, and the types of policies that are available. In case of disaster, buying home insurance is one way to protect yourself against having to risk replacing your home and personal possessions. 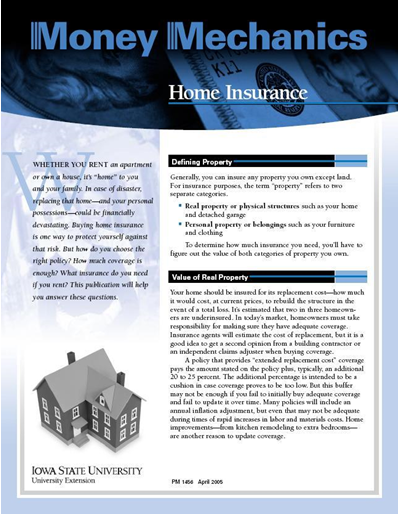 Here’s help on choosing the right policies and coverage. 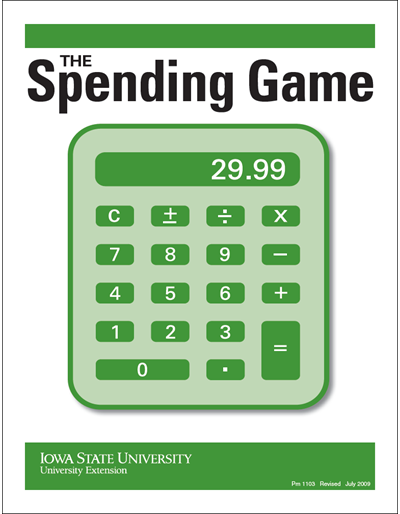 A spending plan is a tool to manage your money. 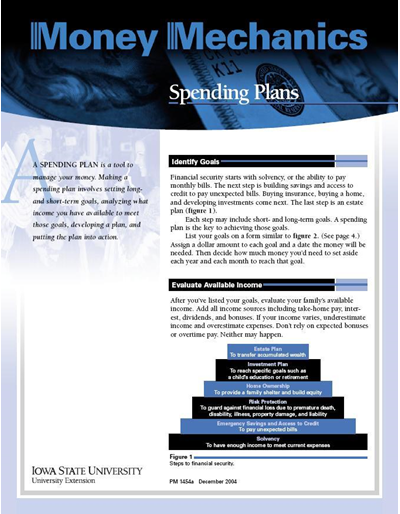 Making a spending plan involves setting long- and short-term goals, analyzing what income you have available to meet those goals, developing a plan, and putting the plan into action. Includes helpful worksheets. 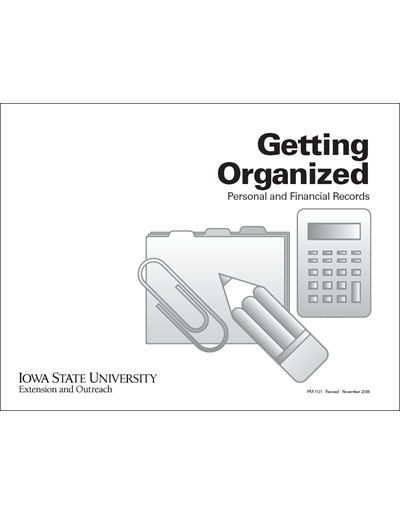 Record keeping can help you keep a close tab on your spending habits, manage your family’s daily financial responsibilities, and locate records and business papers easily when needed. 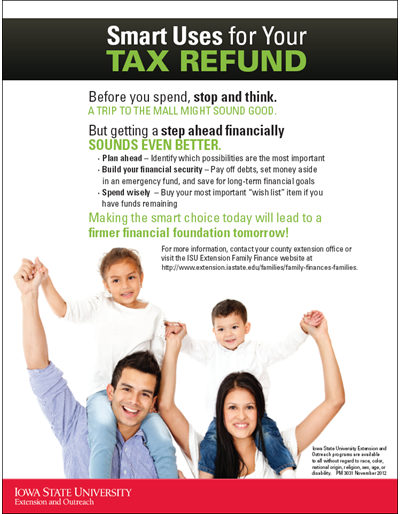 PDF includes an Income and expenses/Net worth statement worksheet. 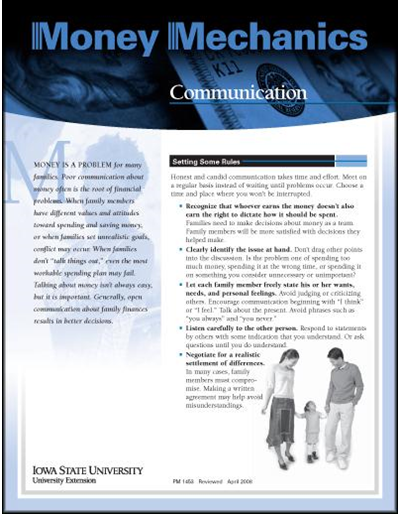 Talking about money isn’t easy but this publication has tips to start your family communicating. 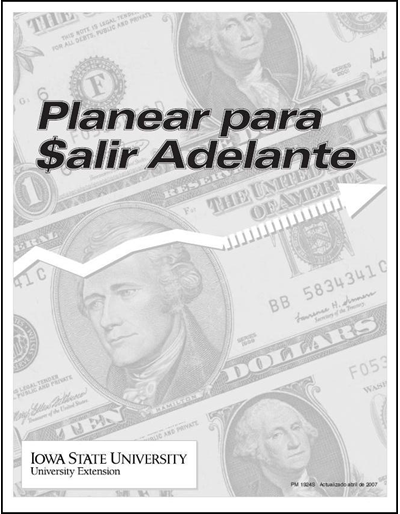 Also includes a plan to reach financial goals and a “talk about money” quiz. 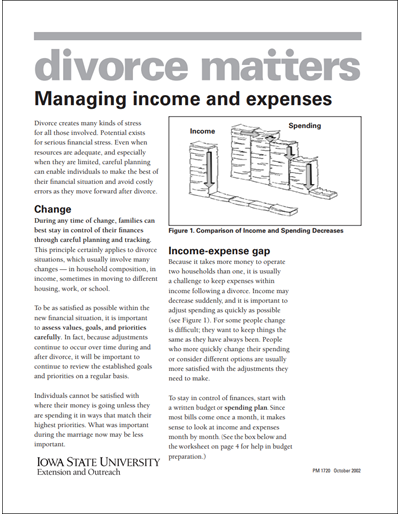 Financial stress from divorce can be minimized by enabling individuals to carefully make the best of their financial situation and avoid costly errors as they move forward. Farmers need to consider some unique situations regardng retirement. 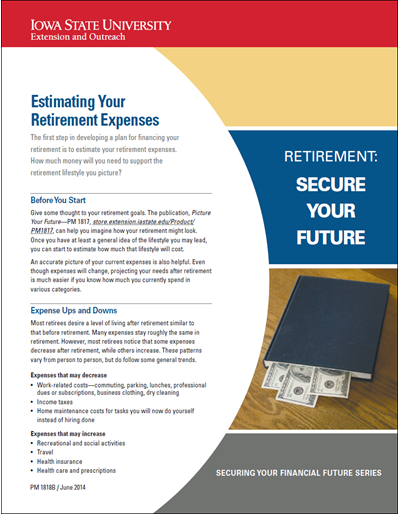 Read about setting retirement goals and estimating cost of living and income in retirement. Two worksheets are provided to help the process. Also discussed -- what will happen to the farm business. It is in the best interests of both generations that the farm transfer be accomplished with a minimum of financial and emotional cost. This publication explores the many options available and how all parties’ needs can be met. In general, there are five major alternatives available to retiring farmers who have no heirs interested in taking over the farm operation. The alternative chosen depends primarily on the amount of leisure time desired and the amount of work the retiring farmer wants to do. As a self-employed individual, a farm operator is covered by social security. 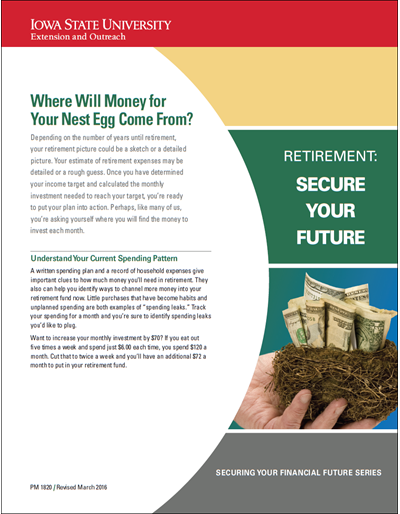 This publication discusses social security issues for farmers prior to and after retirement. As farmland values and stock markets can be unstable, having all of a family’s investments in one venture is risky. 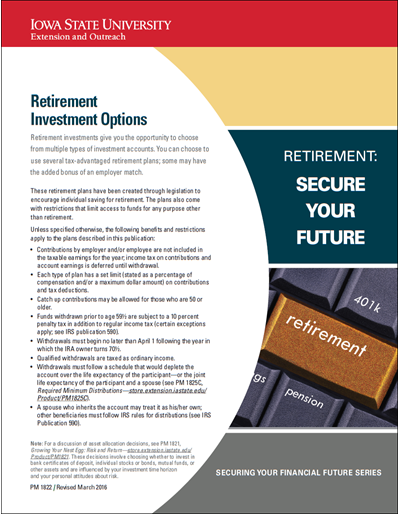 This pamphlet presents issues in investment considerations before retirement and at retirement. 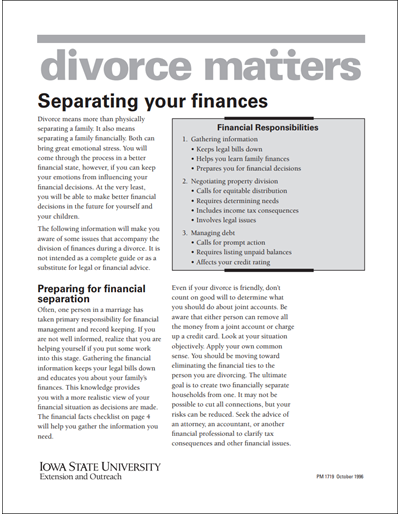 The financial separation that comes with the divorce process can be made less difficult if you find out what your options are and remain aware of your financial situation.